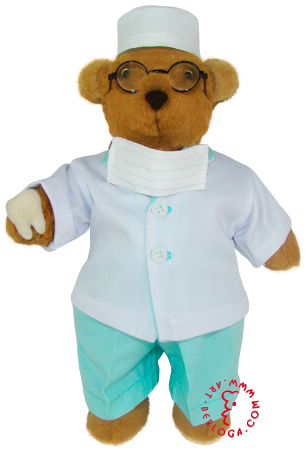 Individual craft of Bear-the-Dentist soft toy. Plush bear crafted by Art-berloga on order. Art-berloga » Custom plush toys » Exclusive Bear-the-Dentist. When little patients of dentist's office are met by doctor's plush assistant, then such office and doctor seems much more fearless. This bear was made in order to make babies feel more friendly to doctors. With understanding that Bear-the-Dentist will be on his duty for long time and in an active manner, we maximized the wearout-proof of the toy. Hence, we had used high-quality material on cotton basis and installed metal split-pins as joints. Each sew of the suit was precisely crafted to ensure its solidity. The suit can be undressed and washed if needed. We offer customize craft of soft toys. Exclusive toys on order by Art-berloga. Fish - mascot of an inveterate fisherman! Individual tailoring of flirt teddy bear.